My mom had a soft spot for ugly dolls. 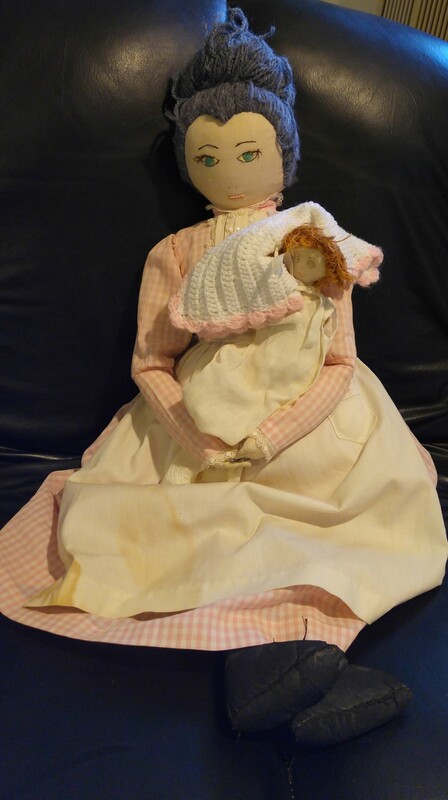 She liked going to antique shops and occasionally purchased the ugliest doll there because she was afraid that doll would never be loved. A few years ago she gave me two of these dolls “for Clare” but Clare really didn’t want them. I often have them sitting on the back of my office sofa staring at the back of my head while I work. The first looks like she’s dressed up to go on a trip. Her clothes are elaborate, handmade for sure. She’s wearing pantaloons and a petticoat under a traveling skirt and coat. The undergarments are finished with lace and the skirt and coat are lined. 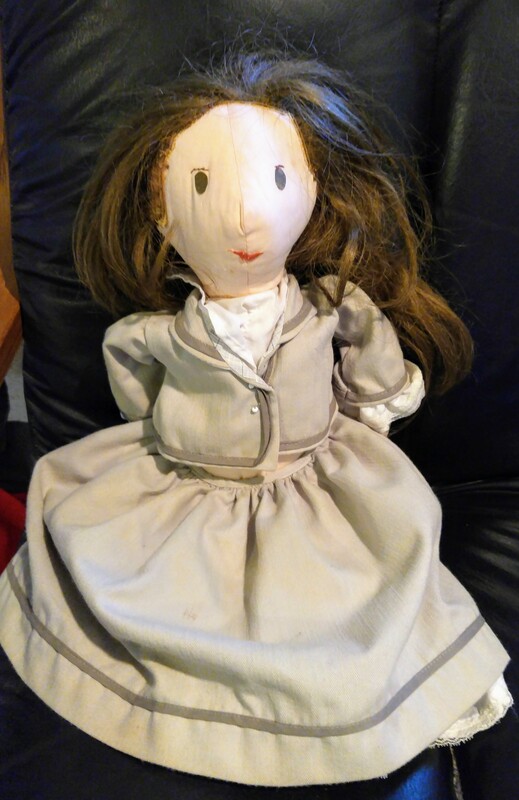 I thought this was a very old doll, but I am now thinking it is not so old, maybe from the 1970s or later. The rear has a stitched name and probably company name: “Meg Jandolls.” What’s creepy about her is her expression. Eyes that bore right into you and a small, slightly askew mouth. The other doll is, I think, much older. I call her the strict nanny. Her graying hair is in a messy bun, Her face is stern (or shyly smiling depending on the angle). She’s wearing a pink gingham dress over a petticoat. Over her dress is an apron. Barely visible in the photo below are her black (removable!) boots.Her hands snap together so she can hold a baby. The baby wears what looks like a baptismal gown and a pink knit shawl. I think both the nanny and the baby had bonnets, but they’ve been misplaced. The baby, now that I look at her without her bonnet reminds me a lot of young Karen from the BBC series, Outnumbered. Okay, maybe not, but to be fair Karen’s hair often looked like the doll’s hair in the early episodes. All three of these dolls will continue to sit in my office unless I decide to put them on the guest beds. I am pretty sure someone could write a Shirley Jackson-type short story about each of these dolls. Oh, they’re funny. I rather like the first doll.